Corot and Courbet: Landscape Paintings or Self Portraits? 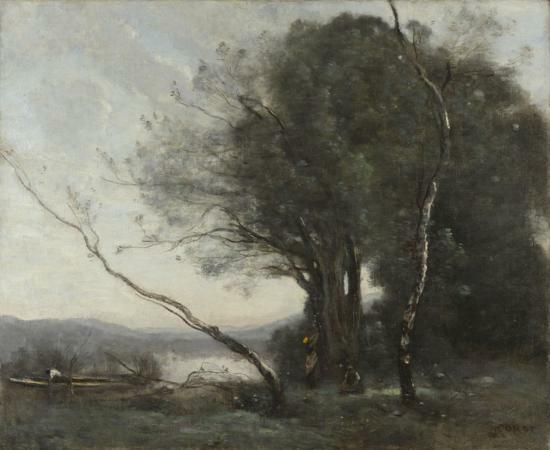 Jean-Baptiste-Camille Corot and Gustave Courbet painted within the same century. Corot lived his seventy nine years during a period of great turmoil and transformation in France, from 1796 to1875. Courbet, a product of the following generation, was born in 1819, and died at age 58, two years after Corot, in 1877. The French Revolution of 1789-1799 eliminated the Monarchy and launched a new era of ongoing struggle for individual freedom and equality, but it was specifically “the whole climate of progressive thought surrounding the 1848 Revolution” that instilled a great passion for democracy in the younger Courbet. (p. 22 Nochlin, p. 2 Robert Hughes) Both Corot and Courbet experienced the feelings of creative liberty during this transformative time and synthesized their realities in their painting with equal devotion though in distinctly individual ways. The two landscape paintings I have chosen to compare, The Oak of Flagey, painted by Courbet, and The Leaning Tree Trunk, painted by Corot, exemplify these artist’s very different realities and temperaments that seem to me to be more like self portraits than mere representations of nature. 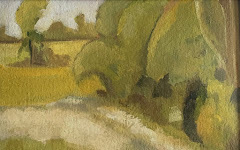 His oil and pencil sketches that he did out in the landscape were what later became the inspiration and subject matter for his poetic work that he accomplished from memory near the end of his life. 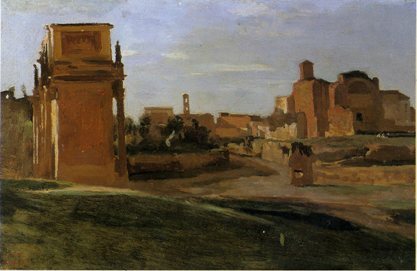 (p 12 Pamarede) In his mature work, the memory of his landscape studies becomes folded into newly invented worlds that reflected his own unique personality. This combative, ambitious, narcissistic and earthy man crazed about women, convinced of his own historical mission ---thought he was the painter of his time. “I am Courbetist, that’s all. My painting is the only true one. I am the first and unique artist of the century; others art students or drivellers’. 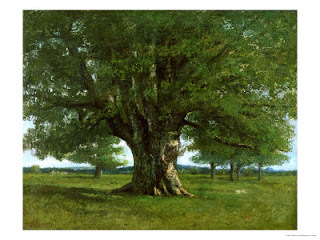 Courbet completed this painting, the Oak of Flagey when he was 45 years old, in 1864. Linda Nochlin states in her essay Courbet and his Territory: How Landscape Means, that “it is a remarkable portrait of a remarkable tree” and “not quite like any other tree painting of it’s time”. Nochlin goes on to say that it was painted at a time when many of the most interesting artists were painting landscape motifs. Courbet placed the tree at dead center, making it the sole focus of the work, painted with careful and concrete attention to form. The strength and density of the image comes from Courbet’s very accurate rendering. Courbet’s brush work is thick, energetic and deliberate. 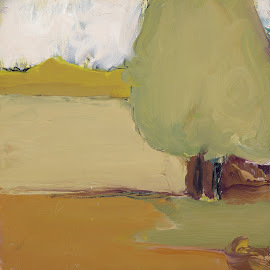 He used his palette knife to lay the paint on the surface, mimicking the light and the thick bark on the tree. By placing the tree front and center he almost exaggerates its importance. The cropping of the top branches forces the eye to focus on the massive trunk. The trunk is the strength, the core and the foundation for the branches and the dense foliage, which feeds the trunk by reaching to the sky for light and air. The roots are massive, lit up with thicker paint to accentuate their important role in anchoring the trunk. His colors are mixed carefully, using close tonal relationships, much like Corot, from dark to light. However, Courbet’s rich greens and browns are more intense than those found in Corot’s foliage. His greens and browns are rich, thick and cover most of the canvas. The sky breaks through here and there, letting us know there is space beyond the tree’s heavy presence, but that it can be reached only by passing through massive amounts of heavy branches and dense canopy. Courbet reveals bits of the mountains in the background, and this pushes the tree forward yet his composition lacks traditional three point perspective. 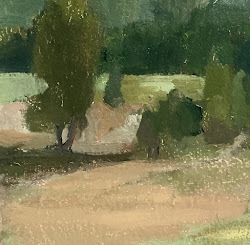 He paints every inch of the canvas with equal importance, using the trees that flank the oak, that although smaller in scale, create the distance needed to accentuate the presence of the main character. 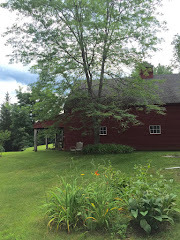 There is a white dog chasing a rabbit, a scene that creates a sense of transience, for Linda Nochlin, and that is used as a foil to once again to accentuate the solidity of the Oak. “tiny harbingers of instantaneity, they emphasize the oak’s endurance by suggesting the opposite, the ephemeral existence of living beings. Yet of course the oak is living too. But the time scale is different, presented as an opposition by the artist”. He has created a kind of self-portrait of the artist as an oak tree, rooted firmly in the ground, energetic and powerful, outreaching and expansive in his generous creation. Nature and artist, landscape and art have assumed a single identity here. Corot and Courbet shared a strong devotion to painting and nature. Both were concerned with representing people, places and things that pertained to the common man, at a time when there was much change in the political climate. Corot was apolitical, yet worked ceaselessly with a calm, steady perseverance and reverence for nature that resulted in a full, serene and mature life that was clearly reflected his paintings. Courbet’s work reflected a brazen, jolting and specifically democratic sentiment, where his ceaseless energy and stubbornness prevailed in his “realistic” forms that often contained unsettling truths of nature and allegories of himself, sometimes seen as self portraits. Their temperaments are reflected through their work— temperaments not the same, but equally driven, innovative and brilliant. 1. Artcritca.com, Gustave Courbet, Metroploitan Museum of Modern Art, New York City, on line at: http:wwwprintfriendly.com/getpg?urlhttp%3A//artcritical.com/2008/03/30/gustave-courbet. 3. Hughes, Robert, Art: An Abiding Passion for Reality Gustave Courbet, Time Magazine, January 9, 1989, on line at http://www.time.com/time/printout/0,8816,956672,00.html. 6. Pomarede, Vincent, Realism and Recollection, In the Light of Italy, Yale University Press, 1996. Print. Henri de Valenciennes. In the Light of Italy, Yale University Press, 1996. Print.